Saskatoon firefighter Lieutenant Bruce Siemens is seeing and feeling the forest fires at close range in La Ronge. "It's amazing how you can drive by an area that's completely green," he said, "and you're forced out five minutes later." 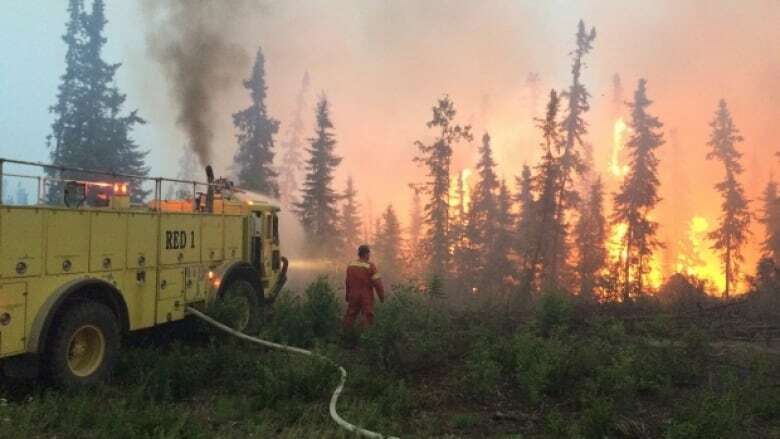 He's part of a 15 person crew from Saskatoon dispatched to La Ronge to help tackle a forest fire area that is swallowing ten times more forest than average. They have a tanker to supply areas with water where there are no hydrants. Saskatoon crews are also watching over the town's industrial area with the help of other firefighters from Prince Albert. "Everybody knows their job," he said. "Actually, it's just like we're working alongside a group of guys in Saskatoon." Siemens said the Saskatoon crew are not as close as the frontline fighters deeper in the forest. "I know one guy, we saw come out, walk out, he had his boots in his hands. He was walking in his socks because the soles of his rubber firefighting boots had melted from the heat. So they're definitely in the thick of it." Siemens said there was heavy fire activity near the airport last night. But things have died down this morning. He said no structures have been lost in La Ronge, but the fire is unpredictable and the smoke is deceptive. Siemens said there is a big difference between urban fire fighting and forest fires. In the forest, a fire can grow and split depending on how it hits lakes, or is fuelled by the wind. Embers spit from the edge of the fire spark which can spark more fires ahead of the line. He said officials are concerned right now about the direction of the fire relative to the wind. "It's kind of perpendicular to the prevailing winds," he said. "If the prevailing winds do come up then it's going to have a front that's three four times the size it was a couple days ago." Siemens said crews from North Battleford would be coming in next to relieve them, and he expects to be back home by mid-week, unless conditions become more drastic.